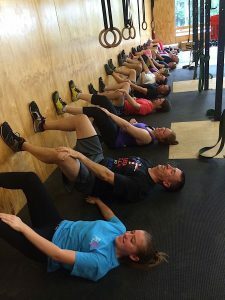 Mobility is a common word used in the CrossFit community, usually to describe a set of stretching or “muscle-smashing” exercises. Others might use the term to define limitations in the body’s ability to attain the correct position when performing a specific movement. For instance, an overhead squat cannot be properly executed without appropriate “mobility” in the hips, shoulders, and ankles. So what is mobility in terms of long-term fitness? Mobility has to do with more than just flexibility. 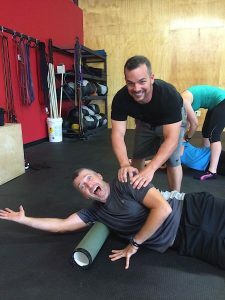 When it comes to consistent training and long-term fitness, it is “the measure of how well, easily, and unassisted a person can move.” So, next time you think of mobility, also consider these things: how pain-free is the movement? How much time in your day is spent in motion? When your coaches incorporate mobility training in your CrossFit classes, they are aiding your body in recovery. The goal with post-workout mobility is really about the next day of training. Unnecessary soreness in muscles will limit your range of motion and certainly affect your willingness to move well and easily in your next workout. Further, coaches have an interest in increasing your level of flexibility. Increased flexibility allows the athlete to move correctly, which decreases risk of injury. When sitting, make sure you have good posture. Next time you are at the gym and it is time to start your class, don’t dread the group warm-up! It should not be rushed, and you certainly should never skip it. This time is intended to get your muscles, joints, and, more importantly, your lungs and heart primed for the work that your body is about to do. Most of us arrive at the gym after long periods of time with restricted movement. Ease your body into the workout that is to come. 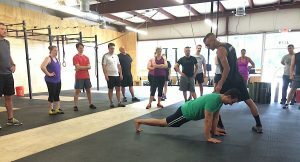 During training, focus on your technique, train your body to move correctly, and avoid the habit of disregarding form for the sake of getting through the movements quickly. Avoid disregarding form for the sake of an extra second off your “Fran” time. In competition, there are times where that extra second or extra pound may mean a world of difference; while training, good form should be the goal. In the long run, good form reduces the risk of injury, while increasing efficiency in the movement. After a tough workout, you’re lying on the floor, focused on the pain in your muscles. The idea of spending even 5-10 minutes on mobilization is more than you can bear- right? I challenge you to change your mindset. Teach yourself that your training is not over once you finish the WOD. The workout is only complete when you have treated your body to a mobility session that will make it possible for you come back the next day. The time immediately after your workout, when your body is nice and warm, is a great opportunity to work on flexibility or even accessory work. To close, regular mobilization is treating your body with kindness. Mobility will allow the athlete to maintain their performance status for the long-term, while increasing mobility and minimizing recovery time. You only have one body, so take good care of it: warm-up, prioritize movement in everyday life, and find the value in post-workout mobility. Every athlete should enjoy the blessing of being able to move well, easily, and unassisted for years to come.